For many years, “relevance” was the goalpost for search engines, and it’s easy to understand why. Relevance is intuitive, and it was a good enough goal in the early days of search. Times have changed, especially with ecommerce search. The goalposts have moved and they’re not going back. Behavioral data is being used to personalize search results – Tech giants Google, Microsoft, Netflix and others are using behavioral data for processing search queries. Although relevance is still important to search algorithms, using behavioral data to inform search results is on its way to being commonplace. Users don’t mind having their data shared if it means more attractive search results – Customers are willing to share their behavioral data with search engine operators (not just Google, but all site operators) in exchange for results that are attractive to them. NNGroup reported verbal confirmation of this from a user panel in their recent study of personalization usability, data collection and privacy. Customer behavior on sites with Constructor Search confirms that prioritizing attractive search results improves key metrics like conversions and clickthroughs. So what does this mean for ecommerce site search? The answer is not surprising: when behavioral data and machine learning algorithms inform search results ranking, both users and site owners see improved outcomes. Let’s take a closer look at exactly what we mean when we use the terms “relevance” and “attractiveness” – and how they impact site search as a whole. For automated information retrieval systems, “relevance” is a quantified measure of how precisely a document or set of documents matches the user’s request. For more than a decade, traditional search engines have relied on term-weighting algorithms, such as TF-IDF to deliver relevant results for search queries. Simply put TF-IDF evaluates individual documents against the entire corpus of documents and scores relevance based on keyword frequency and density. A 2015 research study found that 83% of search engines use TF-IDF to solve for relevance. Nothing in TF-IDF addresses “attractiveness.” But that’s not to say that relevance should be dismissed. Relevance, pardon the pun, is still relevant. In fact, for libraries, document management systems and historical records, relevance alone might still be good enough. This is because users of these search engines are looking for “fact-based” results. A search for “four score and seven,” should return Abraham Lincoln’s Gettysburg Address, for every user, at any time, and in all contexts. Not so for the users searching ecommerce sites. The queries are messier. The product catalogs are changing frequently. The users have diverse motivations. The “relevant” result from the query may be different from what the shopper is hoping to purchase. This is where behavioral data, machine learning and the idea of “attractiveness” are game changers. While relevance can be easily defined as ensuring that query results are present in the user’s query, attractiveness is more difficult to pin down. Keep in mind that we’re not talking about attractiveness in the sense of fashion or beauty, but rather a given result’s “desirability” for a particular user. The results of a query last month could be different from the results this month. Likewise, one person’s query may not be at all attractive to someone else. Learning attractiveness at scale requires a lot of data and algorithmic analysis. Traditional search algorithms would process her query using term-weighted relevance measures for “laptop computer.” But a better experience would focus on results that are relevant and attractive to her. Search results that are relevant and attractive improve conversions. Both traditional and modern search engines will exclude a “lap desk” from our search results based on low relevance. However, this is the point at which the paths of traditional search and more modern search diverge. When attractiveness is factored into results ranking, a modern search engine will shine. 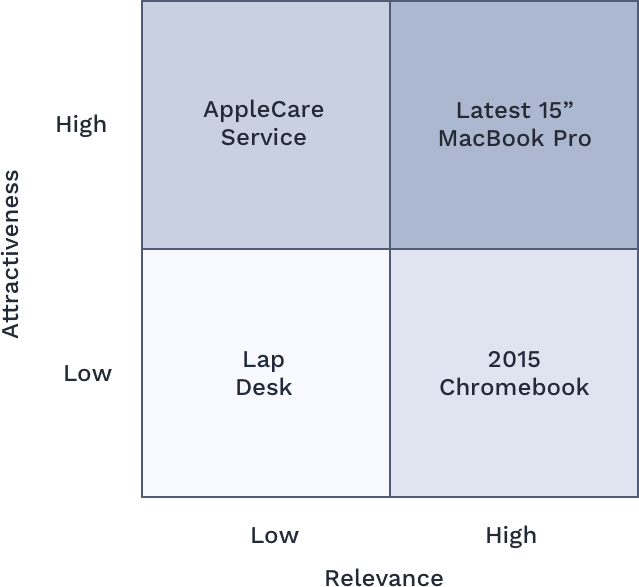 Attractiveness algorithms use the contextual and personal data to make the latest 15” MacBook Pro a top ranking result for our scenario, even though the 2015 Chromebook is similarly relevant. Both a first time visitor and a budget-conscious shopper would each get personalized, optimized results. If relevance was the only criterion for results, all shoppers would see the same results. And they’d all have to work harder to find what they prefer. Constructor Search combines relevance weighting with behavioral data from “the crowd” and “the individual” to return better results. Importantly, attractiveness allows for complementary add-ons to rise in the search result rankings in appropriate cases. A relevance-only algorithm would be challenged, for example, to see a connection between a support plan and laptop computer from the same manufacturer. There’s a lot more that a modern search engine can use in scoring attractiveness. This includes product catalog metadata, image quality associated with the product, price relevance relative to other similar products, inventory levels, gross margin, current promotions to name a few. The approach Constructor encourages is to utilize behavioral data, machine learning algorithms and automation to deliver relevant and attractive search results automatically. The key word here is automatically, as in letting machine learning do the heavy lifting across every product, user and query. Let us show you how you can quickly and easily embrace attractiveness in search results to drive conversions, revenue and customer loyalty. Contact Constructor today to schedule a personalized demonstration of Constructor Search.